It was a great pleasure to see so many of you in Kyoto last month. Congratulations to everyone involved in making the meeting such a great success with over 3,100 in attendance. 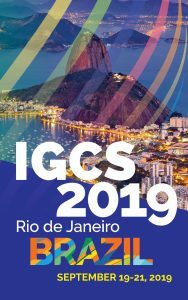 This was the last meeting for the IGCS that occurs in a biennial pattern; IGCS 2019 will be the first Annual Global Meeting being held in Rio de Janeiro Sept. 19-21, 2019. IGCS continues to grow (with over 2,650 members) and evolve in many ways to achieve our goal to become a society that truly represents its international membership. The Annual Global Meeting is no exception. We are very fortunate to have Nadeem Abu-Rustum from Memorial Sloan Kettering in New York as the chair of our inaugural Annual Global Meeting. The IGCS Scientific Program Committee has been restructured in a way that provides an equal opportunity for contribution from all regions of the world. The committee has been expanded to include Regional Chairs that represent five global regions: Latin America, Europe, Africa/Middle East, USA/Canada, and Asia/Australia. Each Regional Chair has asked additional members from their region to assist in identifying trends, issues, opportunities and challenges facing their region along with encouraging submission of important science for peer review. The 2019 Scientific Program Committee recently met to discuss the new committee structure and how the committee can work together to address the interests of the different regions in the planning of IGCS 2019. It was truly a great sight to see over 40 key opinion leaders from around the world gathered in one room, working together to achieve a common goal. In addition to the regional groups, a new subcommittee on Breast Disease has also been added to the Scientific Program Committee. As the percentage of gynecologic oncologists treating breast disease globally has been steadily increasing, our members have been requesting more educational content on breast disease. With the spread of genetic testing and hormone replacement therapy, the fields of ovarian, endometrial and breast cancer often overlap. With IGCS’s multidisciplinary membership, we have the opportunity to gather experts in surgery, chemotherapy and radiotherapy to work together integrating gynecologic oncology and breast medicine. Another new topic for our Annual Global meeting will be enhanced education in pre-invasive cervix disease. Our educational programs have focused primarily on invasive endometrial, ovarian, cervical and vulvar cancer. However, there is interest from our growing global membership to expand these programs to the management of pre-invasive cervical, vaginal and vulvar disease. At the IGCS, we have a responsibility to help reduce mortality from cervical cancer worldwide and to help raise awareness about the importance of both HPV vaccination and cervical cancer screening. The IGCS has received multiple requests from members and societies from different regions of the world asking for pre-invasive educational programs along with our recent member practice data that shows of the survey respondents (550+) over 80% perform pre-invasive work on a regular basis as part of their practice. There have also been requests for the IGCS to include content in congresses and meetings, which address training in colposcopy and treatment techniques such as loop electrosurgical excision procedure (LEEP) and ablative techniques (cryotherapy and thermal ablation). Therefore, it is important for the IGCS to develop pre-invasive disease resources for its members. We recently met with the International Federation of Cervical Pathology Colposcopy (IFCPC) and are excited about their involvement in our Global Annual Meeting. I am confident we will have the experts and resources needed to deliver the most up-to-date and relevant information in pre-invasive disease.With this new committee structure along with the new content areas, Council is confident of the continued success at our Annual Global Meeting. I look forward to working with Nadeem and this new Scientific Program Committee to ensure that IGCS 2019 will be one of our best meetings yet. There have been many great accomplishments but much work ahead of us. I would welcome to hear from you at any point in time and you can reach me at r.angioli@unicampus.it. I am honored to serve as your President.